SOUTHERN AFRICAN DEVELOPMENT COMMUNITY: ENQUIRY POINT BENCHMARKING VISIT TO THE U.S.
ENQUIRY POINT BENCHMARKING VISIT TO THE U.S.
A delegation of eight individuals from three Southern African Development Community (SADC) member countries – Lesotho, Malawi, and Zambia – visited Washington, D.C. from January 13-17, 2014. 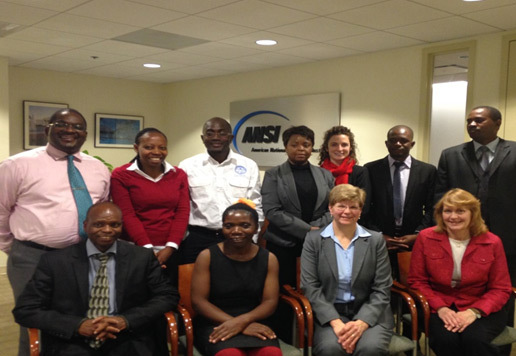 The Standards Alliance worked with the Southern African Trade Hub, a USAID-sponsored project, to coordinate the visit. The main purpose of the delegates’ visit was to participate in national enquiry point training with the National Institute for Standards and Technology (NIST). The WTO TBT Agreement requires WTO members set up a national enquiry point to facilitate the exchange of relevant information and documentation on TBT measures. The U.S. enquiry point is located at NIST. The January training followed up on initial enquiry point training conducted in Lesotho, Malawi and Zambia in December 2013. More information on the December training is available here. In addition, the delegates also had the opportunity to meet with ANSI, ANSI members and several U.S. government agencies. These meetings provided delegates with an understanding for the U.S. standards and conformity assessment and the roles and interests of its various actors.